Uinku, Software Distortion/Overdrive from Tek'it Audio. The new Tek’it Audio Uinku plug-in is a foldback distortion in VST and AU formats for Mac OS X and Windows. 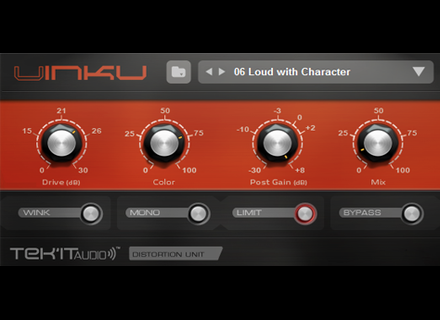 The Uinku plug-in allows for generate subtle to extreme effects, you can even reproduce the sound of the Tek’it Audio Winkl plug-in. The VST2/3 and AU plug-in for Mac OS X and Windows 32 and 64-bit is available for 39€. You can also download a trial version from tekit-audio.com. Igor Vasiliev updates Master Record to v2 Igor Vasiliev, aka iMusicAlbum, has released version 2 of its Master Record tape recorder simulation app for the iPad.